With the possible exception of Patrick Calhoun, Barton Roy Deming was Cleveland Heights' most important and influential real estate developer. His legacy, the "Euclid Golf" district is bounded roughly by Coventry Road on the East, Scarborough Road on the South, the Cedar/Fairmount intersection on the West and Cedar Road on the North. Deming was born in Windsor, Canada, in 1875. His father, Hubert V. Deming, was originally from Watertown, New York, and had settled in Canada, where he became involved in the mercantile and lumber business. Barton was the ninth of ten children. He was educated in Sarnia, Canada, and graduated from its high school in 1892. In 1893 he followed several of his brothers to Cleveland. finest residential neighborhoods in the country. Deming's allotment plan called for a grand boulevard on either side of the streetcar right-of-way that would connect to the Van Sweringen's Fairmount Boulevard district (east of Coventry). Picturesque homes would be developed on the side streets--not so big as to be impractical, but big enough to ensure a "fine class of house." Deming relied on Rockefeller's influence and prestige, as well as his bankroll, to develop Euclid Golf. Deming's House (2485 Fairmount), c. 1919. 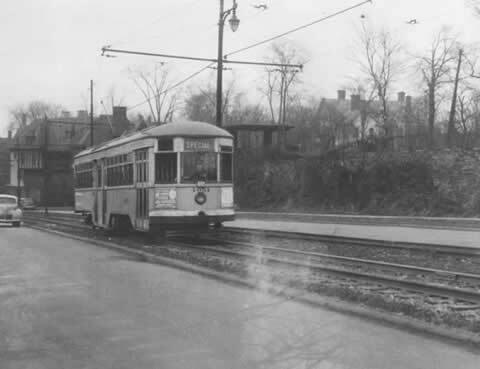 The streetcar line caused some irregularly shaped lots, not the least of which was a steep and rocky sliver of land at the entrance to the allotment, where Fairmount Boulevard meets Cedar Road. Here, Deming and his astute architects, Carl Eugene Howell and James William Thomas, Jr., constructed a four-story French Eclectic mansion. The house served as a gateway and advertisement for the fine quality homes in Euclid Golf. Deming lived in the home (2485 Fairmount Boulevard) from 1914 until the death of his wife, Helen, in March of 1934 and the marriage of his only daughter, Elaine Allen, to Weston Schmitt the same year. He later lived in the Heights Rockefeller Building apartments on Mayfield Road and Lee Road and, just prior to his death in 1956, at Overlook House, a Christian Science Home in Cleveland Heights. The Fairmount Rail Line with the Deming house in the background, c. 1940. Working with architects Howell and Thomas, as well as Maxwell Norcross, Frank Meade, Charles Schneider and others, Deming built numerous homes within Euclid Golf. Deed restrictions, in place until 1950, spelled out setbacks and minimum investment levels. They prohibited many of the commercial uses that had driven Cleveland's elite from their Euclid Avenue homes. 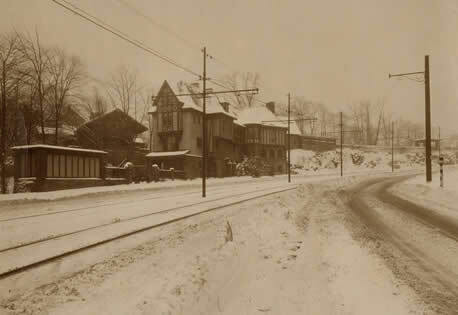 And, as prominent Clevelanders made their homes in Euclid Golf, Fairmount Boulevard became known as "The Euclid Avenue of the Heights."